Some of you may remember Kip's Big Boy who stood for several decades so tall and proud out in front of Grand Prairie's Kip's Restaurant. Sadly, he's gone now, but we're so happy to say, "There's a new Big Boy in town." Forgot to mention...those near the "Pond" say they've never seen so many bugs! They are swarming everywhere since the Pond was completed. And to be fair, I think the mosquitoes are not the only bugs swarming. It's true, we tried to sit in our hot tub the other night and the giant mosquitoes were everywhere. This is our third summer here and I've never seen this type before! 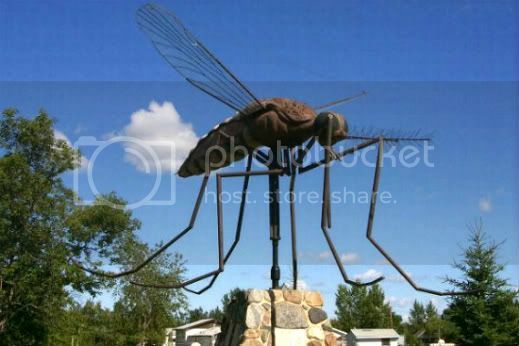 * Mosquitoes are responsible for more human deaths than any other living creature. Worldwide, nearly 4 million people die each year from various mosquito-borne diseases. * All mosquitoes must have water to complete their life cycle. Breeding habitat: Shallow pools and puddles often in hoof prints and tire ruts near human dwellings. Feeding: Bites humans almost exclusively; has an apparent penchant for smelly feet. Diseases: Also transmits the O’nyong-nyong virus and worms that cause lymphatic filariasis, a disfiguring and incapacitating disease. Yikes. Be very careful out there.